I began by highlighting two critical obligations of Counsel: due diligence and making the record. These obligations to the client cannot be stressed enough. Counsel must satisfy the duty of due diligence to ensure the client’s fair trial rights are protected. One element of being due diligent is to make timely and specific objections that preserve the errors for appeal, i.e. making the record. Since on appeal we are bound by the four corners of the record, failure to preserve errors in the record at the time when the errors were made can be fatal to a possible appeal. God may know but the record must show.1Jones v. Vacco, 126 F.3d 408, 417 (2d Cir. 1997). I discussed the principle of free evaluation of evidence generally employed by international criminal tribunals. This principle sets a low threshold for the admissibility of evidence, but does not dictate the weight to be applied to the evidence. This is a civil law approach to admitting evidence with “professional judges” evaluating it and determining the weight to be given to it after all the evidence has been taken. That said, when considering whether evidence should be admitted and given weight, three core criteria must be met: the evidence must be relevant, authentic and reliable. And while relevant evidence is normally not admissible if its probative value is outweighed by the danger of unfair prejudice, “professional judges” are reluctant to disallow the admission of such evidence. This should not be confused with evidence that on its face is tainted because of the means by which it was obtained, such as through torture. 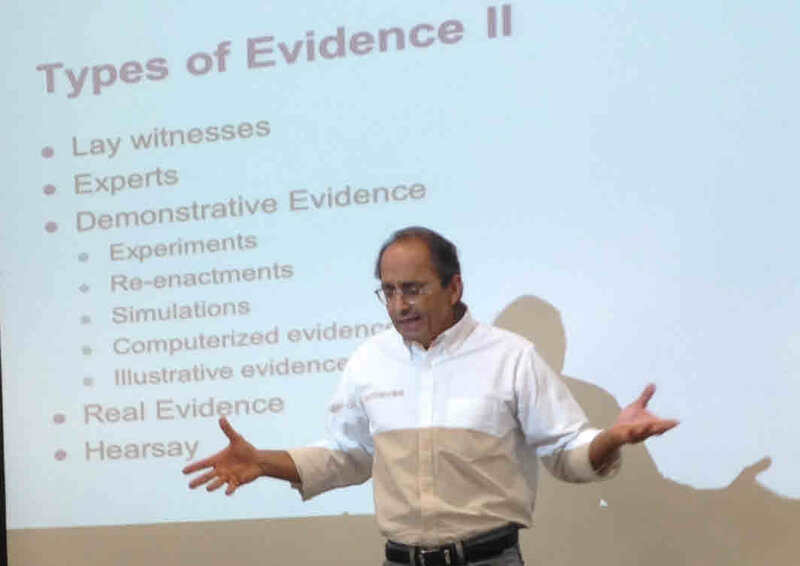 I discussed the difference between direct evidence (clear evidence of a fact) and circumstantial evidence (evidence of circumstances from which a fact may reasonably be inferred), before briefly touching on other types of evidence such as: documentary evidence, demonstrative evidence, real evidence, hearsay, and expert evidence. I also discussed the importance of background evidence for contextual purposes. Compartmentalizing evidence or the broken mirror approach of admitting and using evidence – devoid of context, misleads and distorts. I then moved on to testimonial evidence – the primary focus of the symposium – by discussing the principle of orality. Because accused have a fundamental fair-trial right to confront and examine witnesses, oral evidence is generally preferred, and, barring some exceptions, it is mandatory when the substance of the evidence goes to the acts and conduct of the accused. Generally a witness providing testimonial evidence must have been an eyewitness, must have heard what he/she is testifying about, and must provide independent testimony, i.e. a witness must not rely on what someone else told him or her (this may be hearsay). As such, the source of the evidence is a critical factor: is the witness testifying based on what he or she perceived (heard, saw, felt) or is it based on information extraneously provided to him or her? A vignette: the issue of independent witness testimony arose while I was working on the Ieng Sary Defence at the ECCC. We objected to several unrecorded witness interviews conducted by the Office of the Co-Investigating Judges (“OCIJ”), including one that was staged.2Case of NUON Chea et al., 002/19-09-2007-ECCC-TC/SC, Ieng Sary’s Appeal against the Trial Chamber’s Decision on Defence Requests Concerning Irregularities Alleged to have Occurred During the Judicial Investigation (E221, E223, E224, E224/2, E234, E234/2, E241 and E241/1), 28 January 2013; See eg. IENG Sary’s Request to Hear Evidence from the Interpreter Concerning Witness PHY Phuon’s Second OCIJ Interview whereby Irregularities Occurred Amounting to Subterfuge, 23 August 2012, E221; IENG Sary’s Request that the Trial Chamber Seek Clarification from the OCIJ as to the Existence of any Record Relating to the Questioning of Witness OEUN Tan on 8 October 2012, 29 August 2012, E224 (“OEUN Tan Request”; IENG Sary’s Request that the Trial Chamber Seek Clarification from the OCIJ as to the Questioning of Witness NORNG Sophang on 17 February 2009 and Summon the OCIJ Investigators to Give Evidence Regarding this Interview, 28 September 2012, E234 (“NORNG Sophang Request”). In the course of due diligence, we reviewed tapes of interviews conducted by the OCIJ and noted several statements that suggested there had been prior unrecorded interviews. For example, one interviewer said to a witness: “But I want you to enumerate [your answers] again because yesterday I did not make any audio recording”;3 OEUN Tan Request, p. 1. and another interviewer said to a witness: “As you told me yesterday about a person named Pang…”4 NORNG Sophang Request, p. 1-2. There were no recorded interviews from “yesterday”. We did not know what sources the witnesses were exposed to during the prior unrecorded interviews. We did not know whether the witnesses were testifying in the recorded interviews from their own independent memory or a created memory. And how reliable can such testimony be, especially when the claimed objective of the Trial Chamber at the ECCC is to seek the truth. The absence of an interview record impacts the reliability and weight to be accorded to the evidence, and the assessment of the credibility of those witnesses. It further means that any irregularities are not preserved for appellate review. This issue emphasizes the importance of considering the source of witness testimony, as the accused’s right to a fair trial may be violated where a witness relies on external sources. An important part of trial preparation is helping the witness get ready to give oral testimony, often called “witness proofing” or “witness coaching”, but only when permitted. Generally, the current practice is that Counsel may prepare the witness with a general overview of how the trial proceedings are to be conducted, the basic topics for discussion, and the manner in which the witness should answer questions. However, Counsel may not tell the witness what to say. The ICC does not follow this general practice, as the Pre-Trial Chamber in Prosecutor v. Lubanga5 Prosecutor v. Lubanga Dyilo, Situation in the DRC, ICC-01/04-01/06-679, PTC I, Decision on the Practices of Witness Familiarisation and Witness Proofing, 8 November 2006. prohibited witness proofing in the form of: allowing a witness to read his/her statement and refresh his/her memory; putting to the witness questions that Counsel intends to ask; relying on the witness statement; and inquiring about additional information of both potentially incriminatory or potentially exculpatory nature. 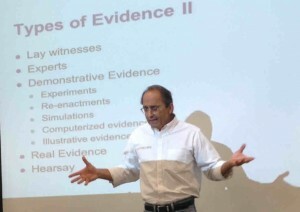 I explained the three stages of analysis of witness credibility: bolstering, impeachment, and rehabilitation. Bolstering is inadmissible and should be objected to as it involves providing evidence that a witness is credible before his/her credibility has been attacked. To impeach a witness is to attack his/her credibility, for example, by attempting to establish inconsistencies in statements or contradictions with other testimony or physical evidence. Once a witness’s credibility has been impeached, rehabilitation is permissible whereby character evidence, usually opinion and reputation testimony, may be used to establish that the witness is truthful. On the topic of competency, I explained that a witness must be competent to testify, i.e. mentally and morally competent, able to communicate, competent to testify on the subject matter, and not subject to privilege. I also discussed judicial competency: judges must draw from the evidence on the trial record and cannot assume the role of a witness or an advocate. In Prlić et al., for example, Judge Prandler commented on the report of an expert witness while the expert was being cross-examined, noting that “I found Mr. Donia’s book and report [a] rather very well-researched and documented one.”6 Prosecutor v. Prlić et al., IT-04-74-A, T-1993/25-1994/1, 11 May 2006. This view was not shared by the Defence, which was obvious by the thrust of the cross-examination, as Defence Counsel questioned the quality of the report which lacked any supporting authority. On occasion, Judge Prandler would also comment on the evidence based on his personal knowledge. Apparently, Judge Prandler did not appreciate the cardinal rule that judges should not be testifying and certainly should not be factoring in personally-held information that has not been adduced into the record through witnesses or documentary evidence. I briefly went over the most common objections one is likely to encounter during a trial. I also provided general guidelines on how, when and why to make objections. For instance, just because you can object, doesn’t mean you should! Counsel needs to be thinking both strategically and tactically. The basic questions one needs to ask is: how is this objection furthering my case? 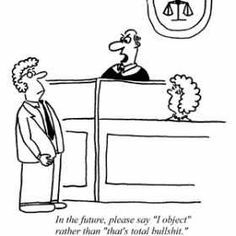 If the point is inconsequential and registering the objection on the record is of no real value, should the objection be made? The answer is generally, no. As I am fond of saying for every aspect of trial advocacy: You need to know the WHY in order to know the WHEN; but if you do not know the HOW, knowing the WHY and WHEN will be of no help. So if you know how to object, then you must also know when to make timely objections and the specific ground(s) why you are making them. Failure to make a timely objection results in a waiver. An objection should highlight the issue for the trial judge and state all relevant grounds for the objection. You should ground the objection in the fair trial rights of the accused, and always seek a ruling on the objection. If it is sustained, you must seek curative relief. If it is overruled, you should make an offer of proof for the excluded evidence so that the issue is preserved for appeal. For example, the offer of proof may take the form of examination and cross-examination of the excluded witness, affidavits signed by the witness which summarize the excluded testimony, or a statement by Counsel about the content of the excluded testimony. An overruled objection is not the end of the matter: you must be conscious of the issue reappearing during the trial, which “opens the door” for the objection to be renewed. The major points to take away regarding objections are to make timely and well-reasoned objections, articulate your reasoning why the objection against you is unfounded and should be overruled, and always make an offer of proof for the excluded evidence. In two hours one can only scratch the surface of this highly technical but most important subject relevant to trying cases in domestic courts or international tribunals. Comprehensive handout material was provided to the participants. If your are interested in receiving a copy of the material, just contact me by leaving a comment/reply to this post (your email address will not appear on the public section of the blog). The question is asking for speculation. The questioner is making a speech, not asking a question. The question is a hypothetical being posed to a non-expert. The question misstates the witness’s testimony. The question misrepresents the evidence. The question has been asked and answered. The question goes beyond scope of cross/re-direct examination. The question is objectionable because of its substance. The question is objectionable because the witness is not competent to answer. The question asks for information that has been already declared inadmissible. The answer is not responsive to the question. The answer volunteers information beyond the question. The answer contains information that has been already declared inadmissible. The question asks for information about an occurrence without establishing that the witness has knowledge of the predicate facts. The question asks for information which is confidential and protected by privilege (attorney-client, doctor-patient, husband-wife, religious). The question is calling for speculation. The question goes beyond the expertise of the expert witness (lack of foundation). The witness is being asked to describe what occurred based on something he or she was told by others who may or may not have witnessed the actual event – AND unless independent and credible indicia of reliability of this hearsay is adduced, this hearsay should not be considered or given any weight for any reason. 2. ↑ Case of NUON Chea et al., 002/19-09-2007-ECCC-TC/SC, Ieng Sary’s Appeal against the Trial Chamber’s Decision on Defence Requests Concerning Irregularities Alleged to have Occurred During the Judicial Investigation (E221, E223, E224, E224/2, E234, E234/2, E241 and E241/1), 28 January 2013; See eg. IENG Sary’s Request to Hear Evidence from the Interpreter Concerning Witness PHY Phuon’s Second OCIJ Interview whereby Irregularities Occurred Amounting to Subterfuge, 23 August 2012, E221; IENG Sary’s Request that the Trial Chamber Seek Clarification from the OCIJ as to the Existence of any Record Relating to the Questioning of Witness OEUN Tan on 8 October 2012, 29 August 2012, E224 (“OEUN Tan Request”; IENG Sary’s Request that the Trial Chamber Seek Clarification from the OCIJ as to the Questioning of Witness NORNG Sophang on 17 February 2009 and Summon the OCIJ Investigators to Give Evidence Regarding this Interview, 28 September 2012, E234 (“NORNG Sophang Request”). 3. ↑ OEUN Tan Request, p. 1. 4. ↑ NORNG Sophang Request, p. 1-2. 5. ↑ Prosecutor v. Lubanga Dyilo, Situation in the DRC, ICC-01/04-01/06-679, PTC I, Decision on the Practices of Witness Familiarisation and Witness Proofing, 8 November 2006. 6. ↑ Prosecutor v. Prlić et al., IT-04-74-A, T-1993/25-1994/1, 11 May 2006. Of course I would be interested to receive the material.